The southern slopes of Wharfedale form Ilkley Moor and are immortalised in Yorkshire’s anthem – On Ilkla Moor baht ‘at – known all over the world! Prehistoric man lived here and left behind Bronze Age circles and hundreds of rock carvings. The Moor is a site of Special Scientific Interest and there is nowadays unlimited access for walkers and lovers of nature to enjoy the fresh air and spectacular views across Wharfedale. There is even a permanent orienteering course and opportunities for rock climbing on the Cow and Calf Rocks (photo, above) and in Rocky Valley (all very easy to reach from us). 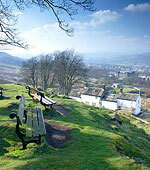 In the 19th Century Ilkley became a very popular spa town. Visitors flocked to take the waters and bathe in the cold water baths. According to the local history, around 1780 a shepherd had an accident and severely damaged his leg. The wound refused to heal. But by daily immersion in the ‘waters of Ilkley’ at White Wells, the wound began to heal itself. The modern White Wells (right) is now a café serving hot beverages rather than cold baths. You will find the natural spring water at the back of the premises, still flowing, and people are able to tap the source of the ‘miracle cure’ for themselves, so do’nt forget a water bottlet. Most visitors these days seem to prefer to drop a coin into the waters to wish for health and happiness! The Victorians built moorland tarns and wooded ravines such as Mill Ghyll and Hebers Ghyll. All these can still be enjoyed today as can Middleton Woods – especially beautiful in May when the bluebells are spectacular. On a hot summer’s day, popular places include the River Wharfe with its’ little ‘beach’ and the outdoor lido. 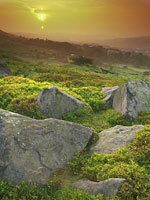 Ilkley is highly regarded for its’ stylish architecture and award winning flowerbeds. 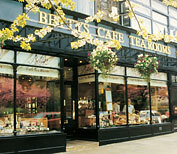 The tree lined shopping streets include award winning tea rooms, (including Betty’s an absolute must), a large number of excellent restaurants and quality shops. There is even a perfectly preserved Victorian arcade, complete with potted palms!